Cairo to Bedreshayn. Cairo to Bedreshayn. Publication: Edwards, Amelia B. A Thousand Miles Up The Nile. London: George Routledge and Sons, Limited, 1891. pp. 35-46. A RAPID raid into some of the nearest shops, for things remembered at the last moment – a breathless gathering up of innumerable parcels – a few hurried farewells on the steps of the hotel – and away we rattle as fast as a pair of rawboned greys can carry us. For this morning every moment is of value. We are already late ; we expect visitors to luncheon on board at midday ; and we are to weigh anchor at two P.M. Hence our anxiety to reach Boulak before the bridge is opened, that we may drive across to the western bank against which our dahabeeyah lies moored. Hence also our mortification when we arrive just in time to see the bridge swing apart, and the first tall mast glide through. Close behind the Philæ lies the 'Bagstones,' – a neat little dahabeeyah in the occupation of two English ladies who chanced to cross with us in the 'Simla' from Brindisi, and of whom we have seen so much ever since that we regard them by this time as quite old friends in a strange land. I will call them the M. B.'s. The other boat, lying off a few yards ahead, carries the tricolor, and is chartered by a party of French gentlemen. All three are to sail to-day. And now we are on board, and have shaken hands with the captain, and are as busy as bees ; for there are cabins to put in order, flowers to arrange, and a hundred little things to be seen to before the guests arrive. It is wonderful, however, what a few books and roses, an open piano, and a sketch or two will do. In a few minutes the comfortless hired look has vanished, and long enough before the first comers are announced, the Philæ wears an aspect as cosy and home-like as if she had been occupied for a month. As for the luncheon, it certainly surprised the givers of the entertainment quite as much as it must have surprised their guests. Being, no doubt, a pre-arranged display of professional pride on the part of dragoman and cook, it was more like an excessive Christmas dinner than a modest midday meal. We sat through it unflinchingly, however, for about an hour and three quarters, when a startling discharge of firearms sent us all running upon deck, and created a wholesome diversion in our favour. It was the French boat signalling her departure, shaking out her big sail, and going off triumphantly. I fear that we of the Bagstones and Philæ – being mere mortals and Englishwomen – could not help feeling just a little spiteful when we found the tricolor had started first ; but then it was a consolation to know that the Frenchmen were going only to Assuân. Such is the esprit du Nil. 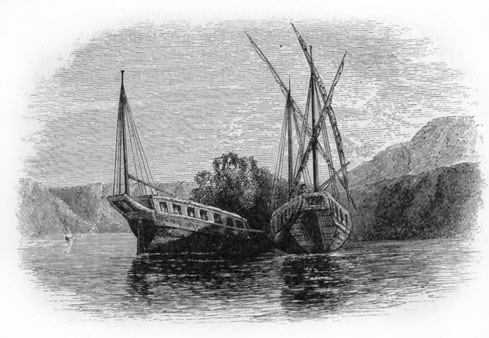 The people in dahabeeyahs despise Cook's tourists ; those who are bound for the Second Cataract look down with lofty compassion upon those whose ambition extends only to the First ; and travellers who engage their boat by the month hold their heads a trifle higher than those who contract for the trip. We, who were going as far as we liked and for as long as we liked, could afford to be magnanimous. So we forgave the Frenchmen, went down again to the saloon, and had coffee and music. It was nearly three o'clock when our Cairo visitors wished us 'bon voyage' and good-bye. Then the M. B. 's, who, with their nephew, had been of the party, went back to their own boat ; and both captains prepared to sail at a given signal. For the M. B. 's had entered into a solemn convention to start with us, moor with us, and keep with us, if practicable, all the way up the river. It is pleasant now to remember that this sociable compact instead of falling through as such compacts are wont to do, was quite literally carried out as far as Aboo Simbel ; that is to say, during a period of seven weeks' hard going, and for a distance of upwards of eight hundred miles. At last all is ready. The awning that has all day roofed in the upper deck is taken down ; the captain stands at the head of the steps ; the steersman is at the helm ; the dragoman has loaded his musket. Is the Bagstones ready? We wave a handkerchief of inquiry – the signal is answered – the mooring ropes are loosened – the sailors pole the boat off from the bank – bang go the guns, six from the Philæ, and six from the Bagstones, and away we go, our huge sail filling as it takes the wind! Happy are the Nile travellers who start thus with a fair breeze on a brilliant afternoon. The good boat cleaves her way swiftly and steadily. Water-side palaces and gardens glide by, and are left behind. The domes and minarets of Cairo drop quickly out of sight. The mosque of the citadel, and the ruined fort that looks down upon it from the mountain ridge above, diminish in the distance. The Pyramids stand up sharp and clear. We sit on the high supper deck, which is furnished with lounge-chairs, tables, and foreign rugs, like a drawing-room in the open air, and enjoy the prospect at our ease. The valley is wide here and the banks are flat, showing a steep verge of crumbling alluvial mud next the river. Long belts of palm groves, tracts of young corn only an inch or two above the surface, and clusters of mud huts relieved now and then by a little whitewashed cupola or a stumpy minaret, succeed each other on both sides of the river, while the horizon is bounded to right and left by long ranges of yellow limestone mountains, in the folds of which sleep inexpressibly tender shadows of pale violet and blue. Thus the miles glide away, and by and by we approach Turra – a large, new-looking mud village, and the first of any extent that we have yet seen. Some of the houses are whitewashed ; a few have glass windows, and many seem to be unfinished. A space of white, stony, glaring plain separates the village from the quarried mountains beyond, the flanks of which show all gashed and hewn away. One great cliff seems to have been cut sheer off for a distance of perhaps half a mile. Where the cuttings are fresh, the limestone comes out dazzling white, and the long slopes of débris heaped against the foot of the cliffs glisten like snow-drifts in the sun. Yet the outer surface of the mountains is orange-tawny, like the Pyramids. As for the piles of rough-hewn blocks that lie ranged along the bank ready for transport, they look like salt rather than stone. Here lies moored a whole fleet of cargo boats, laden and lading ; and along the tramway that extends from the riverside to the quarries, we see long trains of mule-carts coming and going. For all the new buildings in Cairo, the Khedive's palaces, the public offices, the smart modern villas, the glaring new streets, the theatres, and foot-pavements, and cafés, all come from these mountains – just as the Pyramids did, more than six thousand years ago. There are hieroglyphed tablets and sculptured grottoes to be seen in the most ancient part of the quarries, if one were inclined to stop for them at this early stage of the journey ; and Champollion tells of two magnificent outlines done in red ink upon the living rock by some master-hand of Pharaonic times, the cutting of which was never even begun. A substantial new barrack and an esplanade planted with sycamore figs bring the straggling village to an end. And now, as the afternoon wanes, we draw near to a dense, wide-spreading forest of stately date-palms on the western bank, knowing that beyond them, though unseen, lie the mounds of Memphis and all the wonders of Sakkârah. Then the sun goes down behind the Libyan hills ; and the palms stand out black and bronzed against a golden sky ; and the Pyramids, left far behind, look grey and ghostly in the distance. Presently, when it is quite dusk and the stars are out, we moor for the night at Bedreshayn, which is the nearest point for visiting Sakkârah. There is a railway station here, and also a considerable village, both lying back about half a mile from the river ; and the distance from Cairo, which is reckoned at fifteen miles by the line, is probably about eighteen by water. Such was our first day on the Nile. And perhaps, before going farther on our way, I ought to describe the Philæ, and introduce Reïs Hassan and his crew. A dahabeeyah, at the first glance, is more like a civic or an Oxford University barge, than anything in the shape of a boat with which we in England are familiar. It is shallow and flat-bottomed, and is adapted for either sailing or rowing. It carries two masts ; a big one near the prow, and a smaller one at the stern. The cabins are on deck, and occupy the after-part of the vessel ; and the roof of the cabins forms the raised deck, or open-air drawing-room already mentioned. This upper deck is reached from the lower deck by two little flights of steps, and is the exclusive territory of the passengers. The lower deck is the territory of the crew. A dahabeeyah is, in fact, not very unlike the Noah's Ark of our childhood, with this difference – the habitable part, instead of occupying the middle of the vessel, is all at one end, top-heavy and many-windowed ; while the fore-deck is not more than six feet above the level of the water. The hold, however, is under the lower deck, and so counterbalances the weight at the other end. Not to multiply comparisons unnecessarily, I may say that a large dahabeeyah reminds one of old pictures of the Bucentaur ; especially when the men are at their oars. The kitchen – which is a mere shed like a Dutch oven in shape, and contains only a charcoal stove and a row of stew-pans – stands between the big mast and the prow, removed as far as possible from the passengers' cabins. In this position the cook is protected from a favourable wind by his shed ; but in the case of a contrary wind he is screened by an awning. How, under even the most favourable circumstances, these men can serve up the elaborate dinners which are the pride of a Nile cook's heart, is sufficiently wonderful ; but how they achieve the same results when wind-storms and sand-storms are blowing, and every breath is laden with the fine grit of the desert, is little short of miraculous. Thus far, all dahabeeyahs are alike. The cabin arrangements differ, however, according to the size of the boat ; and it must be remembered that in describing the Philæ, I describe a dahabeeyah of the largest build – her total length from stem to stern being just one hundred feet, and the width of her upper deck at the broadest part little short of twenty. Our floor being on a somewhat lower level than the men's deck, we went down three steps to the entrance door, on each side of which was an external cupboard, one serving as a storeroom and the other as a pantry. This door led into a passage out of which opened four sleeping-cabins, two on each side. These cabins measured about eight feet in length by four and a half in width, and contained a bed, a chair, a fixed washing-stand, a looking-glass against the wall, a shelf, a row of hooks, and under each bed two large drawers for clothes. At the end of this little passage another door opened into the dining saloon – a spacious, cheerful room, some twenty-three or twenty-four feet long, situate in the widest part of the boat, and lighted by four windows on each side and a skylight. The panelled walls and ceiling were painted in white picked out with gold ; a cushioned divan covered with a smart woolen reps ran along each side ; and a gay Brussels carpet adorned the floor. The dining-table stood in the centre of the room ; and there was ample space for a piano, two little bookcases, and several chairs. The window-curtains and portières were of the same reps as the divan, the prevailing colours being scarlet and orange. Add a couple of mirrors in gilt frames ; a vase of flowers on the table (for we were rarely without flowers of some sort, even in Nubia, where our daily bouquet had to be made with a few bean blossoms and castor-oil berries) ; plenty of books ; the gentlemen's guns and sticks in one corner ; and the hats of all the party hanging in the spaces between the windows ; and it will be easy to realize the homely, habitable look of our general sitting room. Another door and passage opening from the upper end of the saloon led to three more sleeping-rooms, two of which were single and one double ; a bath-room ; a tiny back staircase leading to the upper deck ; and the stern cabin saloon. This last, following the form of the stern, was semicircular, lighted by eight windows and surrounded by a divan. Under this, as under the saloon divans, there ran a row of deep drawers, which, being fairly divided, held our clothes, wine, and books. The entire length of the dahabeeyah being exactly one hundred feet, I take the cabin part to have occupied about fifty-six or fifty-seven feet (that is to say, about six or seven feet over the exact half), and the lower deck to have measured the remaining forty-three feet. But these dimensions, being given from memory, are approximate. For the crew there was no sleeping accomodation whatever, unless they chose to creep into the hold among the luggage and packing-cases. But this they never did. They just rolled themselves up at night, heads and all, in rough brown blankets, and lay about the lower deck like dogs. The Reïs, or captain, the steersman, and twelve sailors, the dragoman, head cook, assistant cook, two waiters, and the boy who cooked for the crew, completed our equipment. Reïs Hassan – short, stern-looking, authoritative – was a Cairo Arab. The dragoman, Elias Talhamy, was a Syrian of Beyrout. The two waiters, Michael and Habîb, and the head cook (a wizened old cordon bleu named Hassan Bedawee) were also Syrians. The steersman and five of the sailors were from Thebes ; four belonged to a place near Philæ ; one came from a village opposite Kom Ombo ; one from Cairo, and two were Nubians from Assuân. They were of all shades, from yellowish bronze to a hue not far removed from black ; and though, at the first mention of it, nothing more incongruous can well be imagined than a sailor in petticoats and a turban, yet these men in their loose blue gowns, bare feet, and white muslin turbans, looked not only picturesque, but dressed exactly as they should be. They were for the most part fine young men, slender but powerful, square in the shoulders, like the ancient Egyptian statues, with the same slight legs and long flat feet. More docile, active, good-tempered, friendly fellows never pulled an oar. Simple and trustful as children, frugal as anchorites, they worked cheerfully from sunrise to sunset, sometimes towing the dahabeeyah on a rope all day long, like barge-horses ; sometimes punting for hours, which is the hardest work of all ; yet always singing at their task, always smiling when spoken to, and made as happy as princes with a handful of coarse Egyptian tobacco, or a bundle of fresh sugar-canes bought for a few pence by the river-side. We soon came to know them all by name – Mehemet Ali, Salame, Khalîfeh, Riskali, Hassan, Mûsa, and so on ; and as none of us ever went on shore without one or two of them to act as guards and attendants, and as the poor fellows were constantly getting bruised hands or feet, and coming to the upper deck to be doctored, a feeling of genuine friendliness was speedily established between us. The ordinary pay of a Nile sailor is two pounds a month, with an additional allowance of about three and sixpence a month for flour. Bread is their staple food, and they make it themselves at certain places along the river where there are large public ovens for the purpose. This bread, which is cut up in slices and dried in the sun, is as brown as ginger-bread and as hard as biscuit. They eat it soaked in hot water, flavoured with oil, pepper, and salt, and stirred in with boiled lentils till the whole becomes of the colour, flavour and consistence of thick pea-soup. Except on grand occasions, such as Christmas Day or the anniversary of the Flight of the Prophet, when the passengers treat them to a sheep, this mess of bread and lentils, with a little coffee twice a day, and now and then a handful of dates, constitutes their only food throughout the journey. The Nile season is the Nile sailors' harvest-time. When the warm weather sets in and the travellers migrate with the swallows, these poor fellows disperse in all directions ; some to seek a living as porters in Cairo ; others to their homes in Middle and Upper Egypt, where, for about fourpence a day, they take hire as laborers, or work at Shâdûf irrigation till the Nile again overspreads the land. The Shâdûf work is hard, and a man has to keep on for nine hours out of every twenty-four ; but he prefers it, for the most part, to employment in the government sugar-factories, where the wages average at about the same rate, but are paid in bread, which, being doled out by unscrupulous inferiors, is too often of light weight and bad quality. The sailors who succeed in getting a berth on board a cargo-boat for the summer are the most fortunate. Our captain, pilot, and crew were all Mohammedans. The cook and his assistant were Syrian Mohammedans. The dragoman and waiters were Christians of the Syrian Latin church. Only one out of the fifteen natives could write or read ; and that one was a sailor named Egendi, who acted as a sort of second mate. He used sometimes to write letters for the others, holding a scrap of tumbled paper across the palm of his left hand, and scrawling rude Arabic characters with a reed-pen of his own making. This Egendi, though perhaps the least interesting of the crew, was a man of many accomplishments – an excellent comic actor, a bit of a shoemaker, and a first-rate barber. More than once, when we happened to be stationed far from any village, he shaved his messmates all round, and turned them out with heads as smooth as billiard balls. There are, of course, good and bad Mohammedans as there are good and bad churchmen of every denomination ; and we had both sorts on board. Some of the men were very devout, never failing to perform their ablutions and say their prayers at sunrise and sunset. Others never dreamed of doing so. Some would not touch wine – had never tasted it in their lives, and would have suffered any extremity rather than break the law of their Prophet. Others had a nice taste in clarets, and a delicate appreciation of the respective merits of rum or whisky punch. It is, however, only fair to add that we never gave them these things except on special occasions, as on Christmas Day, or when they had been wading in the river, or in some other way undergoing extra fatigue in our service. Nor do I believe there was a man on board who would have spent a para of his scanty earnings on any drink stronger than coffee. Coffee and tobacco are, indeed, the only luxuries in which the Egyptian peasant indulges ; and our poor fellows were never more grateful than when we distributed among them a few pounds of cheap native tobacco. This abominable mixture sells in the bazaars at sixpence the pound, the plant from which it is gathered being raised from inferior seed in a soil chemically unsuitable, because wholly devoid of potash. Also it is systematically spoiled in the growing. Instead of being nipped off when green and dried in the shade, the leaves are allowed to wither on the stalk before they are gathered. The result is a kind of rank hay without strength or flavour, which is smoked by only the very poorest class, and carefully avoided by all who can afford to buy Turkish or Syrian tobacco. Twice a day, after their midday and evening meals, our sailors were wont to sit in a circle and solemnly smoke a certain big pipe of the kind known as a hubble-bubble. This hubble-bubble (which was of most primitive make and consisted of a cocoa-nut and two sugar-canes) was common property ; and, being filled by the captain, went round from hand to hand, from mouth to mouth, while it lasted. They smoked cigarettes at other times, and seldom went on shore without a tobacco-pouch and a tiny book of cigarette-papers. Fancy a bare-legged Arab making cigarettes! No Frenchman, however, could twist them up more deftly, or smoke them with a better grace. A Nile sailor's service expires with the season, so that he is generally a landsman for about half the year ; but the captain's appointment is permanent. He is expected to live in Cairo, and is responsible for his dahabeeyah during the summer months, while it lies up at Boulak. Reïs Hassan had a wife and a comfortable little home on the outskirts of Old Cairo, and was looked upon as a well-to-do-personage among his fellows. He received four pounds a month all the year round from the owner of the Philæ – a magnificent broad-shouldered Arab of about six foot nine, with a delightful smile, the manners of a gentleman, and the rapacity of a Shylock. Our men treated us to a concert that first night, as we lay moored under the bank near Bedreshayn. Being told that it was customary to provide musical instruments, we had given them leave to buy a tar and darabukkeh before starting. The tar, or tambourine, was pretty enough, being made of rosewood inlaid with mother-of-pearl ; but a more barbarous affair than the darabukkeh was surely never constructed. This primitive drum is about a foot and a half in length, funnel-shaped, moulded of sun-dried clay like the kullehs, and covered over at the top with strained parchment. It is held under the left arm and played like a tom-tom with the fingers of the right hand ; and it weighs about four pounds. We would willingly have added a double pipe or a cocoa-nut fiddle1 to the strength of the band, but none of our men could play them. The tar and darabukkeh, however, answered the purpose well enough, and were perhaps better suited to their strange singing than more tuneful instruments. We had just finished dinner when they began. First came a prolonged wail that swelled, and sank, and swelled again, and at last died away. This was the principal singer leading off with the keynote. The next followed suit on the third of the key ; and finally all united in one long, shrill descending cry, like a yawn, or a howl, or a combination of both. This, twice repeated, preluded their performance and worked them up, apparently, to the necessary pitch of musical enthusiasm. The primo tenore then led off in a quavering roulade, at the end of which he slid into a melancholy chant to which the rest sang chorus. At the close of each verse they yawned and howled again ; while the singer, carried away by his emotions, broke out every now and then into a repetition of the same amazing and utterly indescribably vocal wriggle with which he had begun. Whenever he did this, the rest held their breath in respectful admiration, and uttered an approving "Ah!" – which is here the customary expression of applause. We thought their music horrible that first night, I remember ; though we ended, as I believe most travellers do, by liking it. We, however, paid them the compliment of going upon deck and listening to their performance. As a night-scene, nothing could be more picturesque than this group of turbaned Arabs sitting in a circle, cross-legged, with a lantern in the midst. The singer quavered ; the musicians thrummed ; the rest softly clapped their hands to time, and waited their turn to chime in with the chorus. Meanwhile the lantern lit up their swarthy faces and their glittering teeth. The great mast towered up into the darkness. The river gleamed below. The stars shone overhead. We felt we were indeed strangers in a strange land.